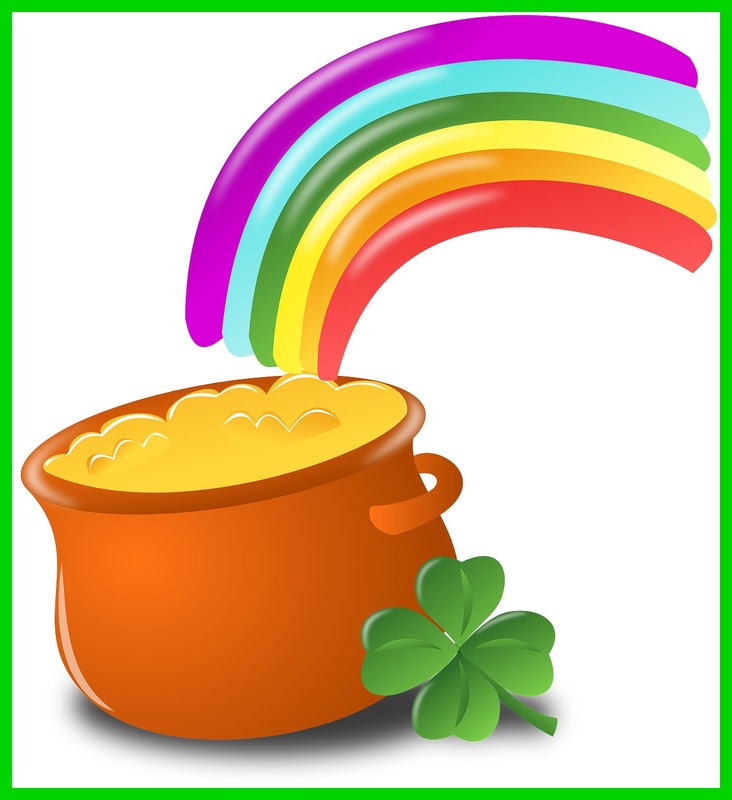 On March 17, many people celebrate St. Patrick’s Day by dressing in green, searching for the pot of gold at the end of the rainbow, and keeping an eye out for the ever mysterious leprechaun. 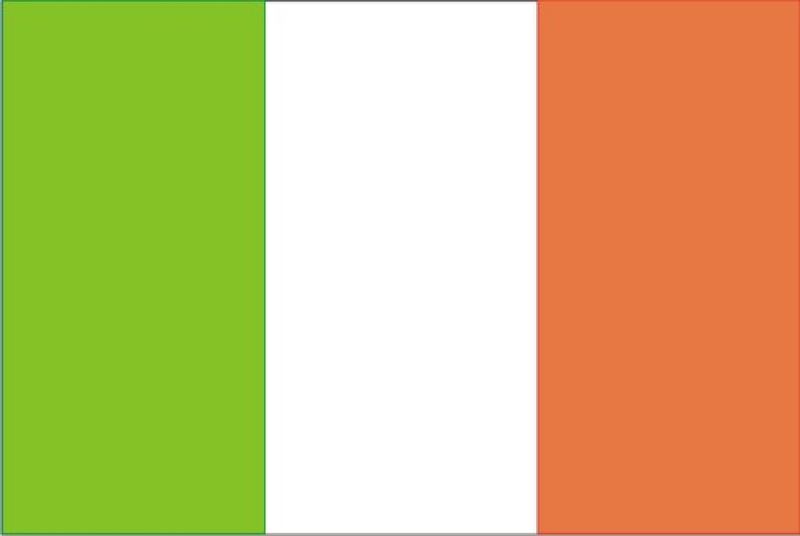 The man behind St. Patrick’s Day, however, was a missionary who took the gospel to Ireland. 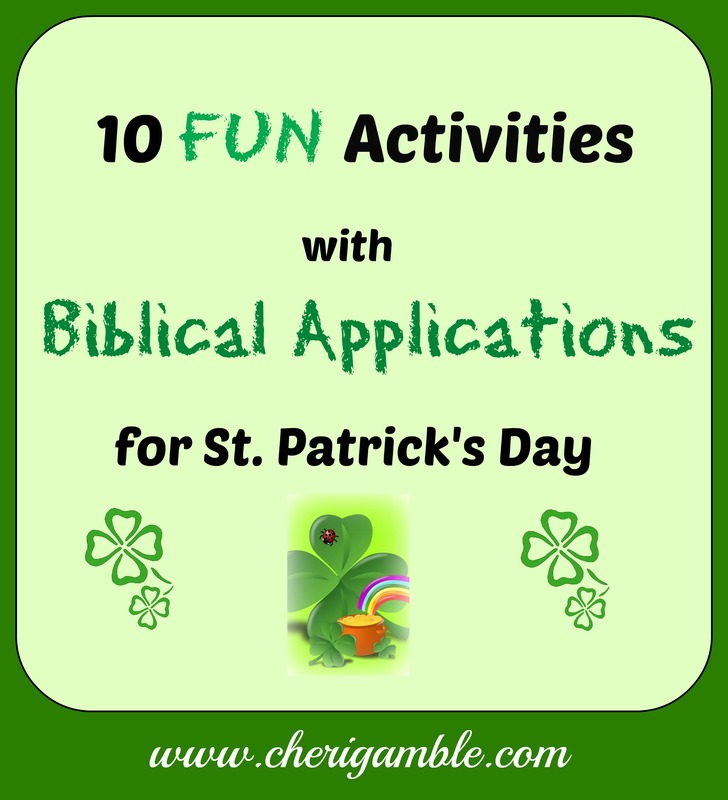 In the spirit of St. Patrick, why don’t we use the day to instill some great gospel messages to our children, while still having fun with many of the symbols? Today I will give you ten ways to do just that. 1. God wants us to take His message to everyone everywhere! The Bible Lesson: Read Acts 1:8. According to this verse, God will give us the power to be His messengers to the whole world! First, we must start at home (Jerusalem), then we must venture out into our surrounding area (Judea and Samaria), and finally, we must go to the ends of the earth. St. Patrick did this, and so can we! The Activity: Make a three leaf clover craft. There are a lot of great ideas out there, and you can be as elaborate or as simple as you and your child desire. The important part is to use the craft to help you and your child think of ways you can tell others about Jesus! There are three leaves on this clover – just like there are three locations where Jesus told us to take the gospel. On each leaf of your clover, write how you can take the gospel to that area (neighborhood, surrounding community, end of the earth). Then spend time praying for each area to hear about Jesus. The Bible Lesson: Read Matthew 5:14-16. We are the light of the world! That means we need to let our lights shine all over the place. Everyone who sees us should know that we love Jesus – and we should want everyone else to get to know Jesus through us! How did St. Patrick show that he was the light of the world? How can we show our lights in our communities? 3. We can truly find our pot of gold at the end of our rainbow! The Bible Lesson: Make a “Salvation” rainbow that leads to a pot of gold! Perhaps you have heard of salvation bracelets before – each color bead represents a different part of the gospel message. Well, why not do the same thing, only with a rainbow and pot of gold for St. Patrick’s Day? Next, make a red layer for your rainbow. Red stands for the blood of Jesus. 1 John 1:7 is a great verse to use for this layer. Follow the red layer with a blue layer which stands for baptism. Acts 2:38 works well with this layer. Next, add a white layer to represent what happens when our sins are washed away. We are cleansed . . . clean . . . pure. Isaiah 1:18 can go with this layer. Then add a layer of green. Green reminds us that we need to grow in our faith. 2 Peter 3:18 is perfect for this layer. Finally, add your pot of gold at the end of your rainbow. This pot of gold represents heaven. Some day we will be in heaven with Jesus. John 14:2 is a great verse for this. So see, you really CAN find a pot of gold at the end of the rainbow! There’s a lot of great craft ideas for making rainbows and pots of gold, but the one that I think would work the best with this Bible application is this one from Crafty Morning. Check it out! 4. We need to grow in our faith! The Bible Lesson: Read 2 Peter 3:18. We need to grow closer to Jesus each day! Talk with your child about ways that he can grow as a Christian. (Suggestions include reading the Bible, praying, attending church, telling others about Jesus, listening to Christian music). 5. God holds us in His hands and will not let us go! 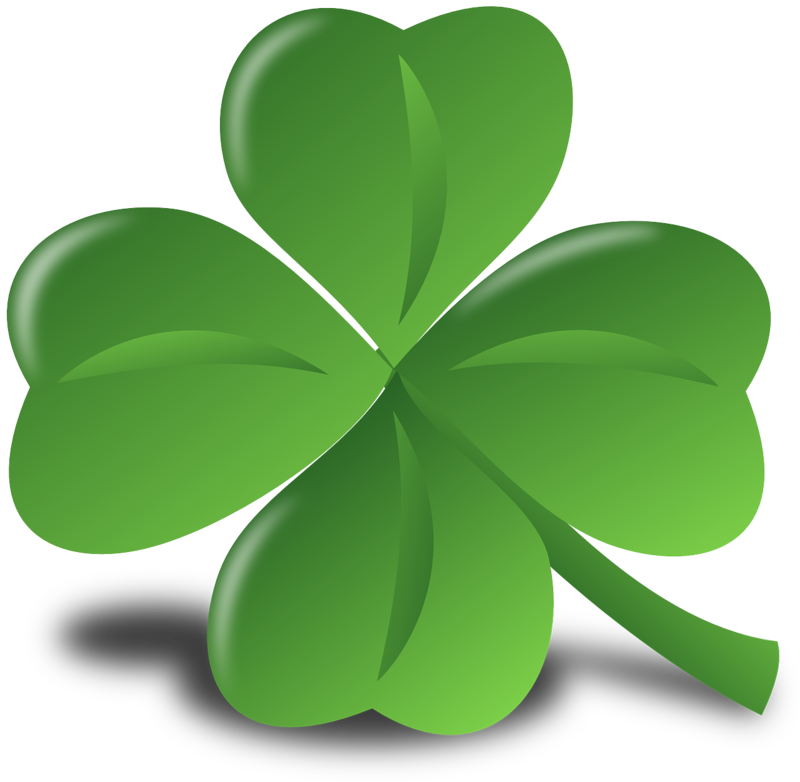 The Bible Lesson: It is hard to do a post like this without taking a look at the three leaf clover in relation to God the Father, God the Son, and God the Holy Spirit. Here is a fun way to explore this concept with an extra special little “twist”. The Activity: Make a pretzel three leaf clover snack, with a tasty chocolate treat in the middle. As you are making this snack, explain to your child how God is holding him in His hands. The pretzels each represent one part of God (God the Father, God the Son, and God the Holy Spirit), while the chocolate in the middle represents your child. God is protecting and surrounding your child . . . He loves your child and will not let him go. And, when your child eats the snack, remind him that God will even go with your child into dangerous, scary and dark situations – just like the pretzels went with the chocolate into your stomach! 6. God gives us many blessings! The Bible Lesson: Jesus came so that we could have life. He willingly gave up His life for us, even though we certainly didn’t deserve it. Read John 3:16-17 and talk about the sacrifice that Jesus made for us. 8. I will Show the World that I’m a Christian! The Bible Lesson: We need to let everyone know that we are Christians. The Bible says that if we confess Jesus before men, He will confess us before His Father. St. Patrick certainly confessed Jesus before men, didn’t he? Read Matthew 10:33-34 and discuss the importance of showing the world that we stand for Christ. Just like we show the world that we are proud of our country, we need to let everyone know that we are proud of God! Have your child make his own “flag” to show the world that He is a Christian. 9. Satan can be deceptive. Be on your guard! The Bible Lesson: Satan is our enemy! He will try to deceive us and get us to sin. We need to always be on our guard against him and his “slimy” ways. Read 2 Corinthians 11:14. Sometimes evil might look good to us, but in the end, it is a sticky mess. 10. We can always trust God’s Promises! The Bible Lesson: God always keeps His promises! One reminder of this is found in Genesis 9:11-17 when God establishes His covenant with Noah. God placed a rainbow in the sky as a reminder of that covenant, and today, we can look at a rainbow and remember that God always keeps His promises! I hope you enjoy these ideas and that you will be able to use them with your children as a way to intentionally share your faith! If you liked what you saw here, please pass this along to your friends. They might like it, too! And, if you haven’t already, please like my facebook page, follow this blog, or follow me on twitter. Thanks and may God bless you as you strive to raise godly children for Him! I never thought of adding in all of these activities! We have never really celebrated St Pattys day! Thanks for this! I’m going to send this to my minister. I’m sure that she’s going to love it for our weekly children’s activity. Thanks! I like the way you tied a bible lesson with the craft project. It can be hard for children to get the meaning of what we are trying to teach them. Using the crafts as a tool to help with this is an excellent idea. Wow you are creative and crafty!!!! And I love the Biblical comparisons you made! Wonderful! So many great ideas here! Thank you!